We were on our way to Block Island and points north this spring when we hit some awful weather off Cape Hatteras. After being hove-to for 10 hours, and seeing nothing but even worse weather between us and Long Island, we decided to duck into the Chesapeake for 'a few days'. Just to wait for a better weather window, you know. Two months later, we are still here. Not that I'm complaining. 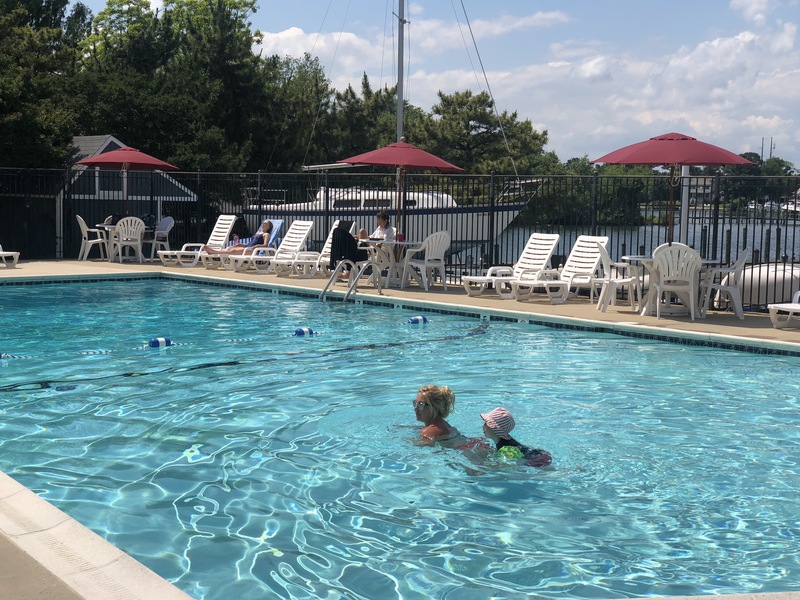 The Chesapeake is one of the great cruising grounds of the world, and we have found a fantastic base of operations here in Solomons Island, MD. A couple of things have delayed us. First, Helena had to head back to Brazil for a few weeks to visit her parents. And then, while she was away, I was dumb enough to trip over the mizzen sheet and land smack on my knees. Kneecap Bursitis was the diagnosis; a month of rest (at least) was the prescription. Luckily, the best nurse in the world soon returned and I've enjoyed being pampered a bit, whilst doing all the chores on my to-do list that didn't require kneeling. Petronella's second owner, the writer Les Weatheritt, calls what we are doing 'a Big Push'. This is what you have to do every so often with an old boat, to bring her back up to snuff. That's sailor talk for making her seaworthy again. As my knee healed and my list of jobs grew shorter and shorter, I started to think we were almost done with our Big Push. I even made the mistake of saying so out loud. "Have you ever noticed this soft spot on the mast?" "Oh, it's nothing," I said. "Probably a bit of rot just under the paint. It's been on my list for awhile. I just haven't gotten round to it." The soft spot followed the grain of the wood and was about 1/4-inch wide, and 4-inches long. The paint over it was intact, not bubbled or anything ominous looking. I was sure I could just chisel it back to good wood in a few minutes, and fill the shallow groove with thickened epoxy. Painting it would be the big part of the job, so hadn't given it much priority. But with Helena's furrowed brow to motivate me, I soon broke out my chisels and awl and started probing around. A few minutes later, I had a rather gaping hole in the mast. This hole above is about 5-inches high, 1.5-inches wide, and 2 inches deep. You can see I was not shy about vigorously probing the area around the hole, to make sure there was sound wood all around it. It does seem to be sound, but this rot clearly didn't start from the painted side of the mast. The water intrusion obviously came from above or from below, and the answer to that question (above or below?) will make a big difference in the repair. Petronella's mast is hollow with compression blocks where extra strength is needed: at the base, where winches are attached, at the two sets of spreaders, and at the top. My guess is that the lower compression block is probably 4 or 5-foot high, from the base of the mast to just above the boom gooseneck and the winches. If the leak is from above, then the water has worked its way through 3-feet of compression block, nearly to the base of the mast. 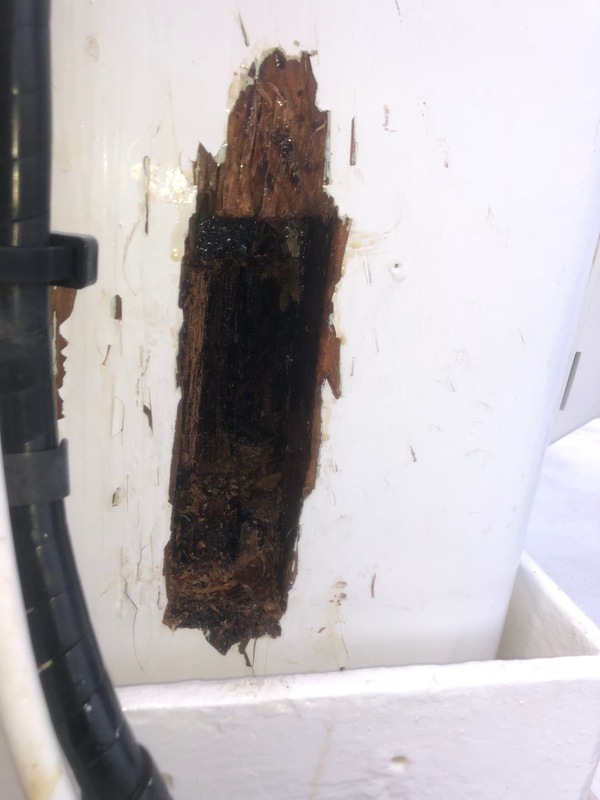 If, however, the mast has been sucking water up from the bottom, (because the end grain is exposed due to paint wearing off, or other reason) then the moisture and rot might be localized at the bottom. Obviously I am hoping for the latter, but there is only one way to know for sure. We had been planning to pull the masts to inspect them and to give them some TLC before heading anywhere adventurous. I'd been hoping to do this over the winter in Florida where there are some good DIY marinas, but we now we will bring this job forward. In a few weeks, we will pull both masts and give them whatever attention they need. Besides the repair, we will inspect both masts thoroughly, re-bed all the hardware, replace any bad sheaves, add any new electronics we might decide we need, and giving them a good coat of paint or two. Luckily, there is an experienced boat builder (Dave) here in Solomons. We will be leaning heavily on him to make sure both masts are seaworthy. Maybe then we will be done with the Big Push? In the meantime, I am going to make a temporary repair so that we can continue our cruise up the Chesapeake. We'll avoid any nasty weather, just to be sure. Hmmm, interesting... The first question I'd be asking is what you know of how the hollow mast was built ie: birdsmouth or barrel form, and what glue was used. Second question is whether there are any internal passages (ie: is there an internal conduit for the wiring for the masthead lights etc)? Even halliards, though I presume not. Don't necessarily discount external damage, cosmetically repaired. I know from experience that when cranking on a halliard, a poorly engaged winch handle can slip out of a mast mounted halliard winch and do a great ding in the mast, fracturing the paint as it does. Just the paint crack left too long, in the right conditions, can start the self-feeding rot going. Something to investigate. The mast was surveyed twice, at the purchase, and by a professional rigger. Neither found any problem. No wires in mast, paint seemingly in good condition. Once we pull the mast and get hardware off, we will try to see what’s happening.